Dr Siwan Thomas-Gibson is a gastrointestinal endoscopist and luminal gastroenterologist. She has been a consultant at the hospital since 2006. Since 2011 she has been the Clinical lead for the department and the deputy director of the Bowel Cancer Screening unit. Her specialist interests include the prevention, diagnosis and endoscopic management of pre-cancerous colonic lesions, both as a screening procedure but also in patients with inflammatory bowel disease and those at increased risk of developing colorectal cancer. She specialises in advanced endoscopic imaging and complex therapeutic endoscopy including endoscopic mucosal resection, colonic stricture dilation and colonic stent insertion. A significant part of her role in the department is devoted to postgraduate education and training of endoscopists. Her work in the area of training in colonoscopy aims to improve the quality and standard of care to all patients undergoing endoscopic examination. Dr Thomas-Gibson has represented the hospital at numerous national and international meetings. In 2002 she was awarded the John of Arderne medal by the Royal Society of Medicine's coloproctology section for her research work. 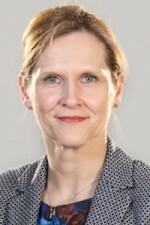 In 2006 she was awarded an MD for her work in 'Improving Training and Assessment in Colonoscopy'. This work has generated a number of scientific papers and book chapters. She is regularly invited to speak on issues concerning the improvement of colonoscopy standards. She regularly teaches national and international trainees attending endoscopy hands-on, therapeutic and lecture courses. She is actively involved in research and development in endoscopic training. She is a member of the British Society of Gastroenterology. She sits on the British Society of Gastroenterology Endoscopy committee and represents the unit an the World Endoscopy Organisation.